Google is an extremely powerful search tool. You can do normal searches in their search box and you will see good results. 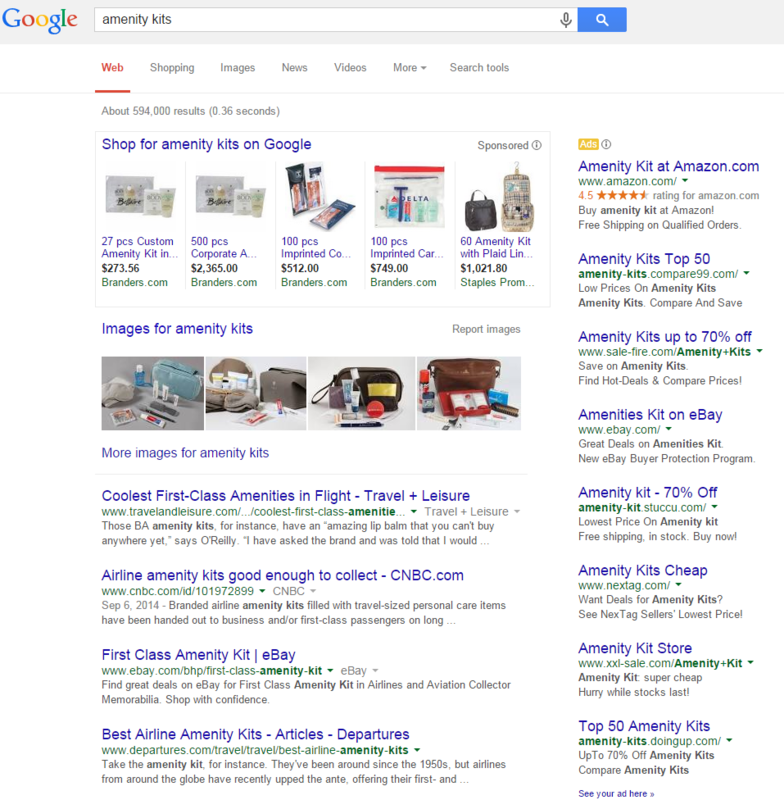 Chances are the results will be fine for everyday searchers. However, Google has some amazing search commands that you can perform to dig deeper into their database. This is a beginners guide to Google search commands and shortcuts. You can use these commands to find very specific websites on the world wide web that you are most interested in. 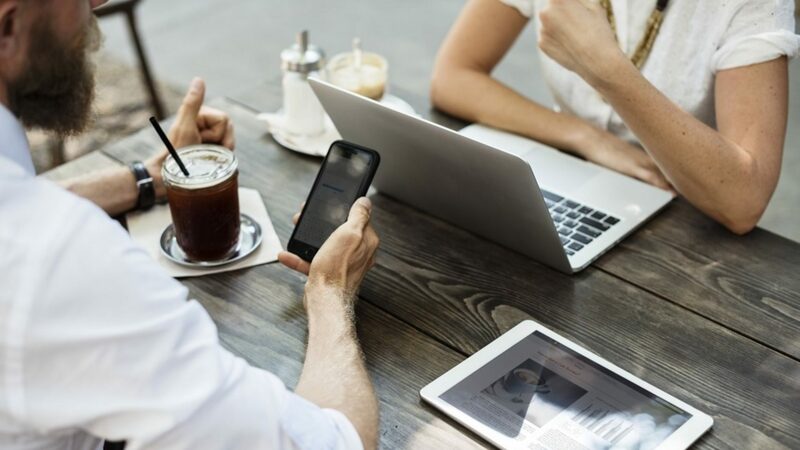 You can use these searches to help with your link outreach if you have a very specific blog post you are trying to promote. 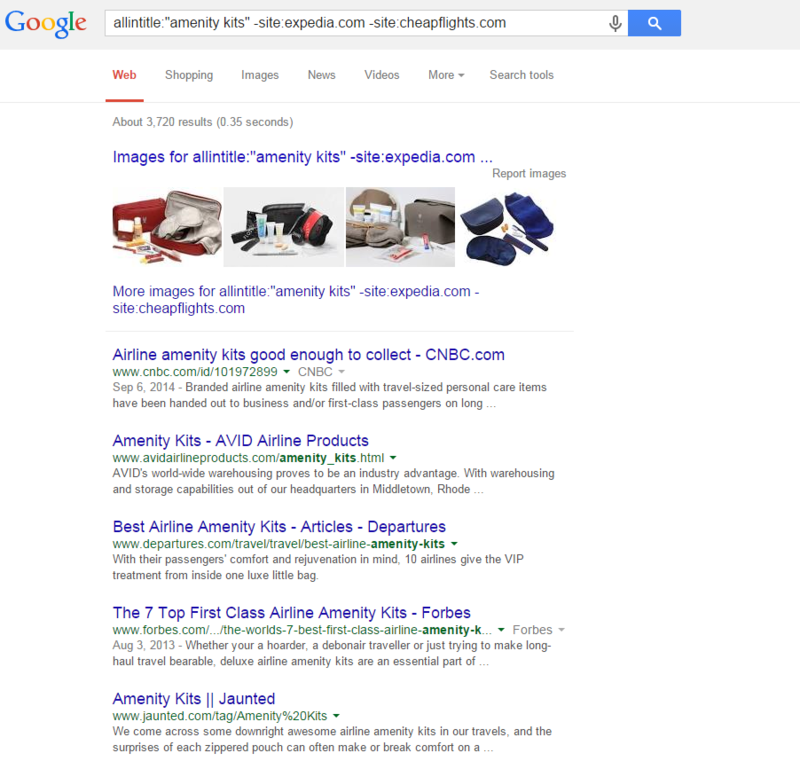 For this example, I want to find websites that talk about airline amenity kits. As a whole this is a pretty broad and generic search as it could bring back anything. Let’s say that I have a blog post on my site about this topic and I want to find similar articles. I want to find these articles so I can share my article with them. Since they also wrote about my topic they would be more inclined to read my article then just a random webmaster would be. If they liked my content they might even share the post online on Twitter and Facebook. Maybe, they might give a link back to our post. The problem with this search is that it is too vague. There are too many results and the results could be about anything. For example, I don’t care about buying a first class kit from Ebay. This result does not help me in what I am doing. Luckily, we have a few operators we can try. This command is pretty cool. This command will tell Google to show search results that have the primary keyword phrase in the written text of the site. To make this work you need to put the primary keyword in quotes. 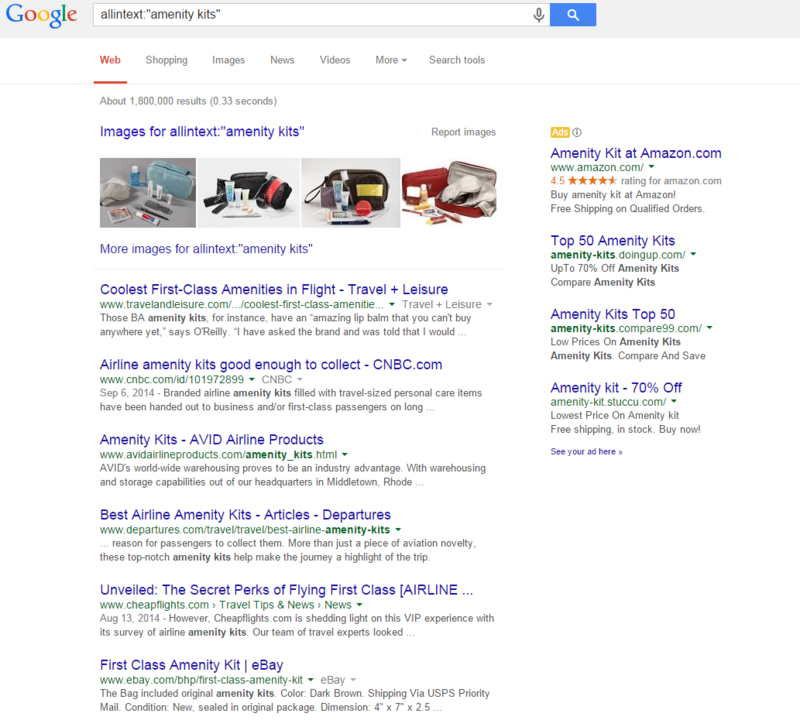 You will notice that all of the search results have Airline Amenity Kits in Bold. Those two sentences below the blue link are the meta name description for the page page. When you perform this search operator you are effectively seeing where that key term shows up on that website. This is good because you can then read to make sure this is a good site and it is (or is not) what you are looking for. This command I don’t use as much. 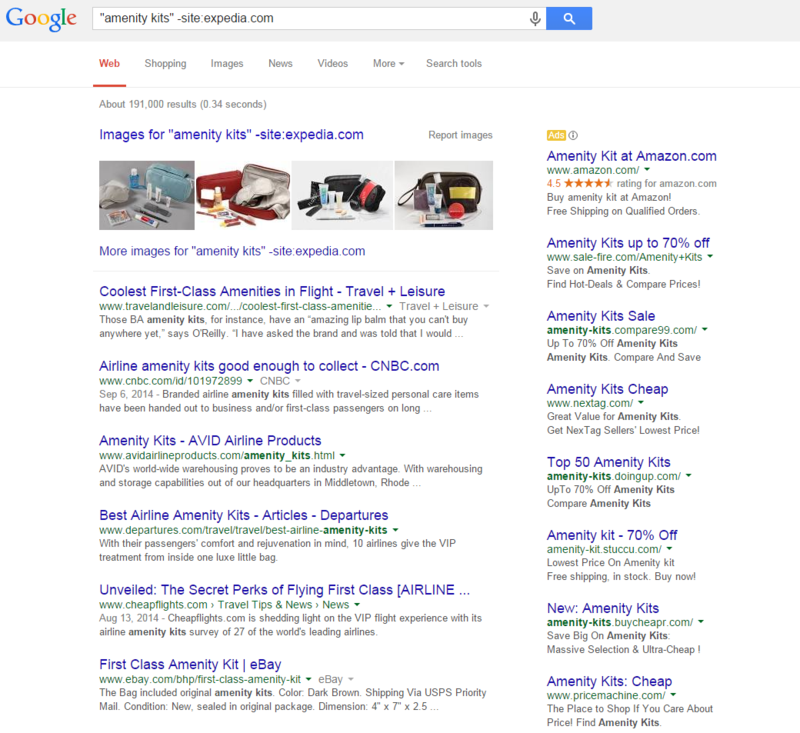 Having the keyword show up in the URL is great, but I have found the results to be not as good. 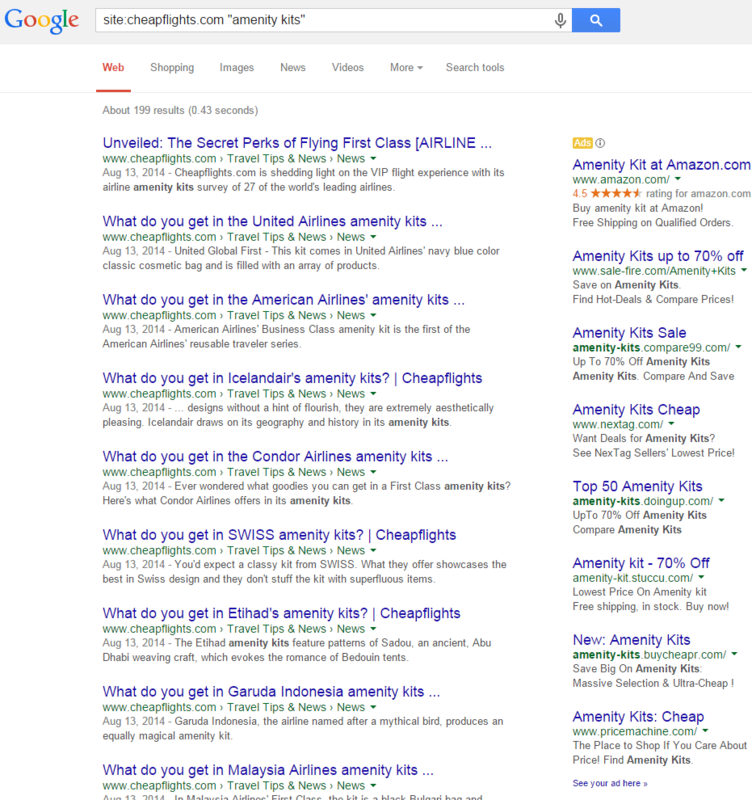 This can really hurt your searches if you have a longer tail keyword. It is still good to use though so I put it on the list. Cool fact about SEO if you care. The second organic listing uses a specific breadcrumb called micro data markup. That is why that URL does not show the primary keyword in the URL. However, if you went to that page you would clearly see the primary keyword in the URL. This command is pretty powerful in my option. The title tag is the chapter of that webpage. 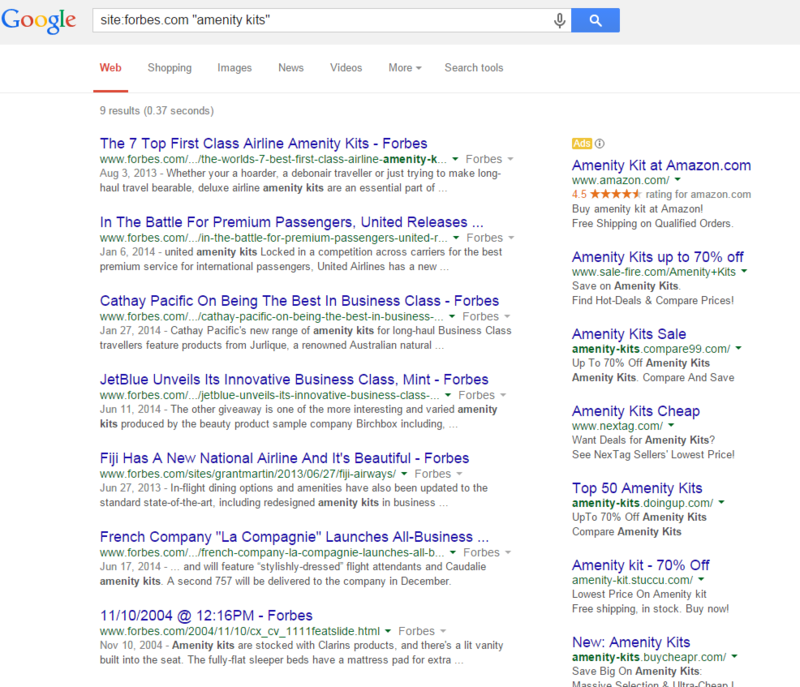 If that keyword is in the title tag, then chances are really good it is addressed further in the content. Again, this is a great operator because it allows the user to find very targeted websites to their search. 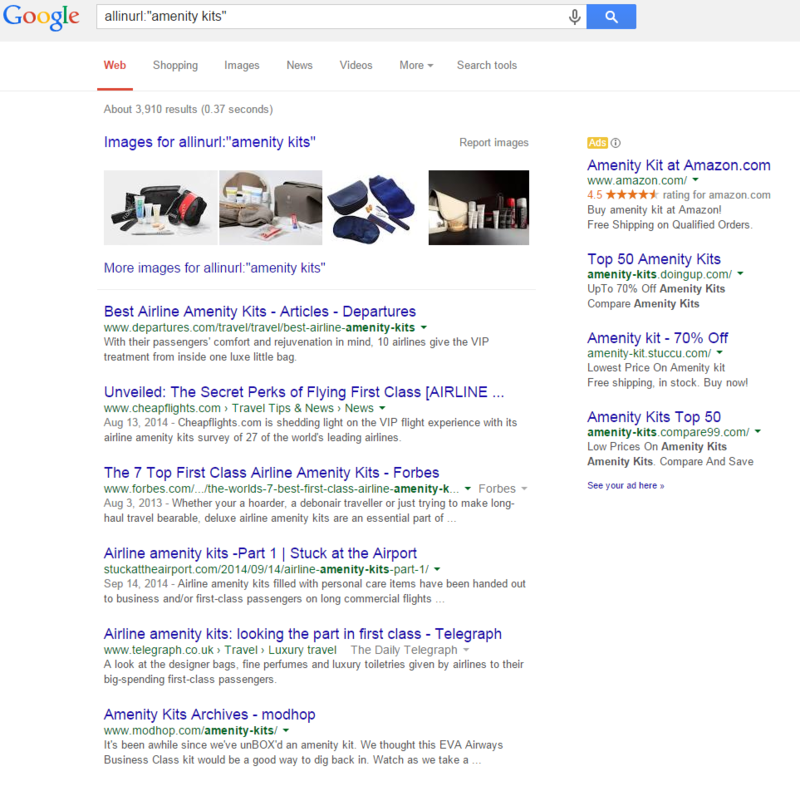 Also, this search operator I feel gives a more accurate representation of websites that talk about amenity kits. Based on this search, you could make the argument there are over 3.5 k websites out on Google that talk about this exact topic. This is great if I wanted to find a PDF version of the search I performed. All I have to do is add this command to my search. 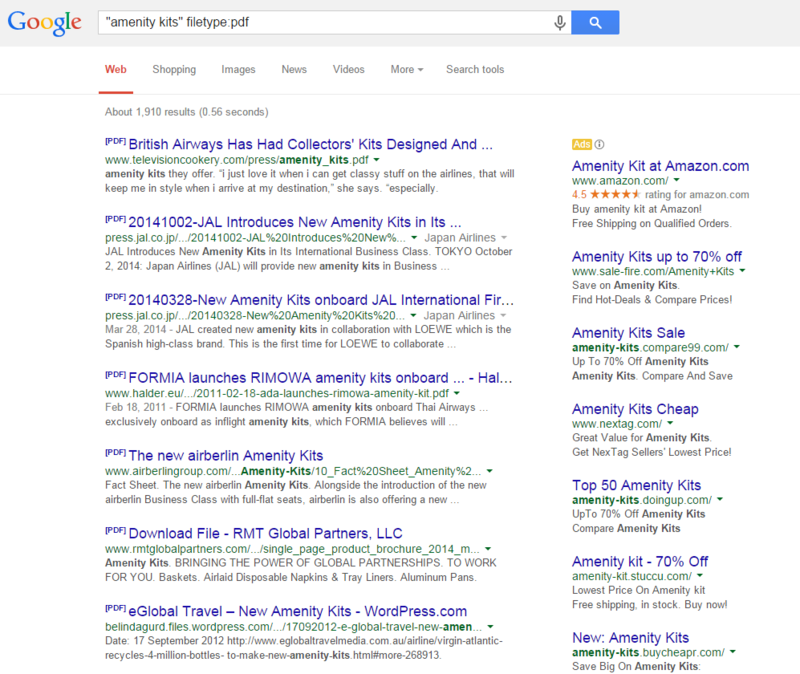 You will notice now all of the organic (left) listings have the [PDF] listing next to them. Everything on the right is a paid ad on Google that just got shown for a really irrelevant search. As a note, if you do PPC then you should use something called negative keywords to not allow your website to be seen for searches like this. Being seen for a search like this will affect your quality score because people will see it, but they won’t click on it since they are looking for PDF’s. This is a pretty cool search operator. For example, I might want to find a very specific topic that is covered on my favorite website. I chose Forbes as an example because their content in my opinion is very good. I might want to look only at Forbes.com to see what they wrote about on a specific topic. This is pretty neat. Let’s say I am trying to find some links, but I don’t want to look at my website. I would perform a command like this. I would say that I am trying to find articles that talk about the primary keyword BUT are not on this website. This is great because I am telling Google basically this. Go out all over the web and show me all the results you can about the keyword, but leave Expedia out of my search results please. This is great if you are a student who are conducting research for a paper. A lot of professors still don’t want their students to use Wikipedia so this is a great way to filter out sites like that. What is cool about Google search operators is that you can start combining them in more creative ways. I am going to show you a few operators below. This example below I added in two search operators that we went over above. 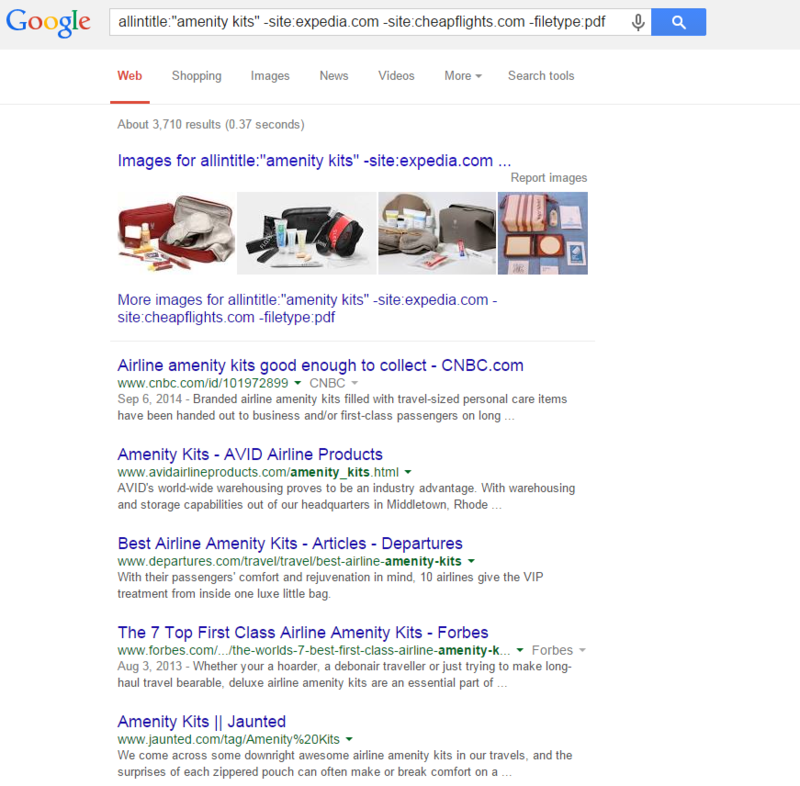 I added the all in title command and I told Google to not show Expedia. Let’s take another search operator and do something cool. Here I decided to tell Google to not show two websites in their search results. Did not expect to see that, did you? Let’s add three to this list and see what happens! 1) I could keep the term on all the pages and confuse Google to show which page is truly about this term. 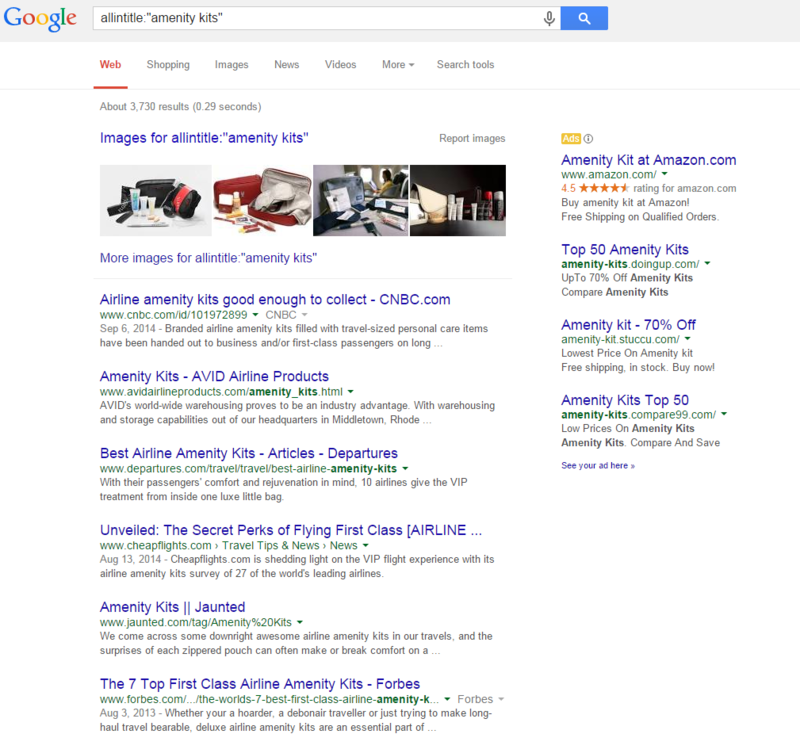 If you have this you can run into keyword ranking problems as Google is unsure what page to show. 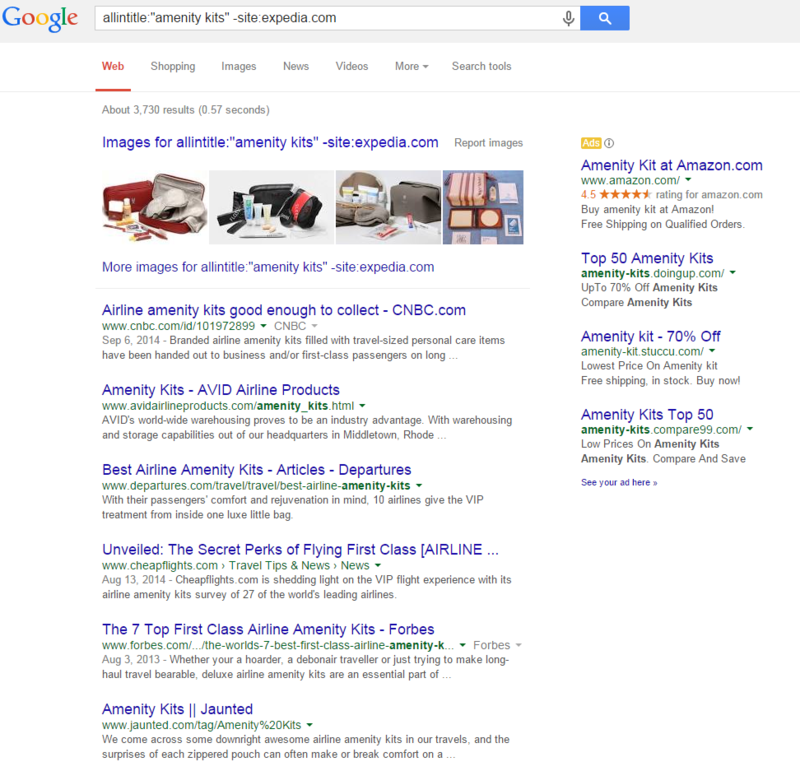 When Google is unsure what page to show they won’t rank your website as high because they might be confused. 3) Consolidate any extra posts that talk about this topic and redirect them to my main page. This could be good if I have a lot of thin content or that the content that I had is slightly outdated. Having a 301 redirect allows any referral visitors to automatically be sent to the new and improved page. I would say this is good because it helps keep my web page highly relevant for my audience and I get the added SEO benefit of taking small pages and pushing them into one main page. 4) If I need to keep all of my posts then I would recommend creating a semantic anchor text strategy back to my main page. I would change the primary keyword into a long tail keyword and link it back to my main page. This is also a great option as it falls into Google’s push towards voice search.